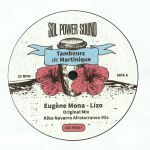 Review: Sol Power Sound's latest must-have 12" serves of some obscure 1980s zouk and Beguine flavours from the French Caribbean territory of Martinique. Side A is dedicated to the wonderfully percussive but surprisingly sparse (think drums, fretless bass, synths and vocals) sunshine dance that is "Lizo" by Eugene Mona. The fine original version is accompanied by a fresh take from Kiko Navarro, who subtly combines all of Mona and company's original elements with a jaunty Caribbean house rhythm. Turn to the flipside for the tropical disco-era Beguine brilliance of Max Ransay's "Ti Kanno" - think dense tropical drums, disco horns, celebratory chorus vocals and meandering synthesizer lines - and a suitably beefed up contemporary tweak from the Sol Power All-Stars.